This translation of an article in Dutch newspaper het Financiële Dagblad, 2 februari 2009, pp. 7 was created by Google translate (with only slight modifications by hand). The Dutch version also appears elsewhere on the interwebs. A new tool in the fight against identity fraud has arrived. The Dutch ePassport with chip can be used as additional identification technology for Internet transactions. Without loss of privacy. This is evident from NLnet Foundation funded research Martijn Oostdijk and Dirk-Jan van Dijk of the Telematica Institute have done. Using a simple card reader, the chip can be read on any PC. The standards to do this are public. The researchers developed software for an identity provider - a trusted party that creates digital identities and provides these to other parties - which they run on a server at the institute. Furthermore, the duo developed software that must be installed on the client's PC. With passport in hand, the user may enter a web shop. The shop might need to know if the buyer is older than 18. The identity provider filters out only the information from the passport required for the purchase, and forwards that information to the shop. The buyer remains in charge of his own data and can terminate the transaction at any moment. The process is intended as additional evidence. Often, a user needs various account names and passwords to use various online services. But such credentials, also credit cards, etc. may fall into the wrong hands. Of course, a passport can also be stolen. "This is why the passport by itself should not be used as identification. But in combination with other authentication means it could stop simple forms of identity theft", said Michiel Leenaars, strategy director of Stichting NLnet. According to Martijn Oostdijk, the system is suitable for all forms of identification. "It's not just for online purchases. The system might play a role in safe surfing by children or patient access to electronic health records, etc." Identity fraud is costing society billions of euros per year. In the U.S., the damage last year was 31 billion euro. 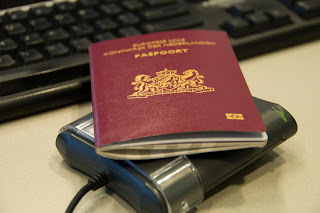 At present, slightly less than half of all Dutch citizens have a passport or identity card with chip. In 2011, that will be the case for all citizens. NLnet Foundation is committed to an open information society and supports projects that contribute financially. Software developed within the projects are published as "open source" and is freely available for parties who wish to further develop it. The Telematica Institute combines innovation power and knowledge of IT to achieve breakthroughs in how we live. Thanks for this really nice article and the blog is too good. Very exclusive blog about online-identity, Quite interesting and nice topic chosen for the post Nice Post keep it up.